Native to South America. Known to be introduced in North America and Spain. Salvinia minima is a floating aquatic fern that invades a variety of aquatic habitats with salinity levels as high as 1.004-1.007ppt. 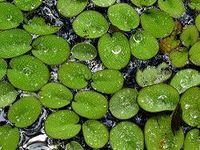 Salvinia minima experiences exponential growth that allows it to completely cover waterways impeding traffic, blocking sunlight, decreasing oxygen levels and degrading habitat for native species of wildlife. Salvinia minima is a free floating, rootless aquatic fern 1-4cm (0.4-1.6") long. It has horizontal branching rhizomes that float just below the water surface and produce, at each node, two floating leaves (fronds), and a third, submersed leaf that is dissected into filaments. The leaves are distributed in whorls of 3. Floating leaves are orbicular to oval in shape, with heart shaped bases and rounded to notched tips. Leaf lengths range from 0.4-2cm (0.2-0.8"). Smaller, orbicular leaves lie flat on the water surface while larger leaves become elongated and fold upright on the midrib. Shade grown leaves remain broadly orbicular, and emerald green. Leaves grown in full sun become larger and elongated and often change from emerald green to rusty brown with maturity and senescence. The upper surfaces of floating leaves are uniformly covered with rows of white, bristly hairs. The stalks of each hair divide into four thin branches that are spreading and free at the tips. The branching hairs create a water repellent shield. Long chestnut coloured hair coats the underside of floating leaves, the submersed filaments, buds and the rhizome. Salvinia minima produces excessive surface growth, which can impede waterways and restrict boating. During earlier stages of colonization S. minima demonstrates exponential growth rates. It has been recorded blanketing waterways 19.3km long and 110m wide and mats have been measured as thick as 20-25cm (7.9-9.8"). Dense infestations block out sunlight and decreases oxygen concentration to the detriment of fish and other aquatic species. When plant masses die, decomposition lowers dissolved oxygen still further. S. Minima can also outgrow and replace native plants that provide food and habitat for native animals and waterfowl. S. Minima can clog irrigation systems, negatively impact fisheries, interfere with power production, and clog water intakes (Aquatic Plant Information System, 2002; Jacono, 2003; Madeira et al. 2003; and McKinney and Durocher, Undated). This page was last edited on 22 August 2011, at 21:24.